The tables at the Sunday farmers market were groaning with early fruits and berries, especially cherries. 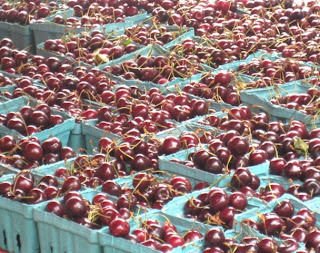 Here's the cherry display at the Dupont Circle market. Normally we would be out picking our own tart cherries--15 pounds or more to make pies and cobblers and freeze for the rest of the year. But somehow we haven't been motivated to drive to the orchard, especially after I discovered Tree-Mendus Fruit Farm in Eau Claire, Michigan. Tree-Mendus Farm, a family run operation going back three generations, grows cherries, peaches and apples, including more than 200 varieties of heirloom apples. They will ship a 10-pound container of frozen tart cherries, already pitted and cleaned, for $33 (plus shipping). I'm trying to decide how that stacks up against driving 30 miles each way to our favorite tart cherry picking site--Butler's Orchard in Germantown, Maryland. We love hanging out at the orchard, but at current rates, the cost of gas comes to more than $8 plus all the CO2 emissions and the time spent pitting the cherries. Before you know it, you've spent the better part of a day on cherries, but then we have a year's worth of tart cherries all bagged in convenient pie-portion packages. Could it really be more environmentally friendly (cheaper, even) to have our tart cherries shipped from Michigan? Or is it more important to support our local farm, even if it means burning all that gas? I make no secret about my love for composting. If I couldn't grow another tomato, I would happily spend my time tossing grass clippings and old leaves and food scraps together to make new soil. With vegetables I merely feed myself. With compost, I feed Planet Earth. Composting is one thing I can do to keep the earth turning in the right direction. Nations that neglect the health of their soil do so at their peril. North Africa used to be the breadbasket of the Mediterranean. Now it is desert. Today, humans have fooled themselves into thinking we can douse the soil with synthetic fertilizers and deadly poisons and reap an ever-expanding harvest. The latest global food crises proves otherwise. We are killing our soil at the same time we pat ourselves on the back over the purchase of organic milk with pictures of happy cows on the carton. The idea of regenerating our soil is in direct opposition to the exploitative nature of industrial agriculture. Feeding the soil with compost takes the long view of fertility. Raising crops with noxious insecticides and fertilizers made from fossil fuels takes the short route to profits. Anyone who believes in organics, who believes in food that sustains rather than exploits this blue planet we call home, must embrace compost. For further reading on the subject, I recommend a recent article in Grist by farmer/writer Tom Philpott. Tom neatly and succinctly makes the case for being an agitator where nurturing the soil is concerned. It's a rallying cry we should all hear: Even as local and organic foods gain in popularity--even as we witness a bumper crops of new farmers markets--these represent but a tiny fraction of the nation's food economy. In fact, industrial agriculture is expanding, tightening its grip on our food supply and on the political machinery. Here's another universal law for you: wrong thinking, like a bad gas, continues to expand if unopposed. In the wake of record flooding and crop damage in the Midwest, many are beginning to conclude that a major contributor to the floods was the work of humans, converting all that Iowa landscape into croplands, highways, shopping malls. Prairie grass may be boring, but at least it absorbs water. Turns out tilling the soil from one end of the horizon to the other is just an invitation to disaster. But here comes Sen. Charles E. Grassley, Republican of Iowa, urging the U.S. Department of Agriculture to free up tens of thousands of farmers from contracts in which they agreed to hold land in conservation rather than plowing it. At stake are millions of acres that now are home to grasses and wildlife but would be plowed to grow corn and soybeans. Grassley, a leading force in agricultural matters on Capitol Hill, is one of those who believes that turning corn into ethanol has had little to do with the spike in global food prices. While Grassley is calling for conservation land to be plowed, others are suggesting the government ease its requirements for turning corn into fuel. About 25 percent of the nation's corn crop is now converted into ethanol, helping to double the price of corn. The government’s latest projection, released Friday, is that food prices this year will rise as much as 5.5 percent. Some products, including cereals and eggs, are expected to rise about 10 percent. There's a growing call to reduce meat consumption on environmental grounds. Too many calories are being burned to make that hamburger you're grilling this weekend. Escalating meat comsumption in China and India is driving up the price of grain worldwide, contributing to the current food crises. As important as the question of how much meat, however, is the question of what kind of meat. Without doubt, raising livestock in huge, industrial confinement operations is a bad idea. Ruminants such as cattle were not designed to eat corn, soybeans and ground up chicken feathers. Industrial meat is a source of pollution, excessive amounts of bad fat and poor nutrition. But maybe while we are considering eating less meat we could also switch to grass-fed meat. Farm animals are an important part of the process of creating a healthy soil and farm economy. Meat, eggs and dairy from pastured animals also provides more in the way of lean protein, vitamins, minerals and beneficial fats, such as Omega-3. Humans have always been eating meat (just ask the woolly mammoth). We don't need to give it up entirely to to have a healthy planet. At the same time food inspectors are having trouble keeping up with the safety issues posed by all the imported foods streaming across our borders, our U.S. Department of Agriculture is agitating for poultry imports from China despite health issues found in Chinese processing facilities. There are food disasters everywhere you turn, it seems. The latest is the collapse of the blue crab in the Chesapeake Bay. The demise of the crab was foretold at least two decades ago. Over-harvesting and pollution have resulted in the lowest crab catches on record and this year promises to continue the trend. Enter U.S. senators from Maryland and Virginia, proposing the federal government officially declare the crabs a disaster and provide $20 million in emergency assistance to watermen and food processors. The states have both ordered sharp cuts in the harvesting of female crabs because of the decline. Scientists have linked high fructose corn syrup, one of the by-products of our huge, government-subsidized corn complex, with this country's high rates of obesity and diabetes. But that hasn't stopped the food industry, which relies on subsidized corn products for just about everything in the supermarket, from continuing to defend HFCS as a legitimate sweetener. In fact, the Corn Refiners Association recently took out a full-page, full-color ad in the New York Times equating high fructose corn syrup with honey and table sugar. They've also put up a website where you can take a quiz on how HFCS stacks up against other sweeteners. And just in case that doesn't turn you into a cheerleader for school vending machines, the American Beverage Association has sponsored a new analysis showing there is no relationship between drinking sodas and body mass index. 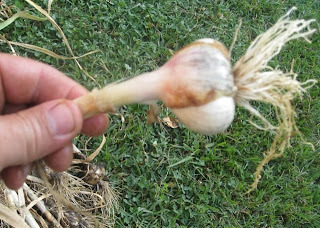 Garlic planted in the fall overwinters and should be ready to harvest sometime in early summer. Yesterday we gathered 40 heads of garlic from a bed outside our front door. This is a softneck variety. 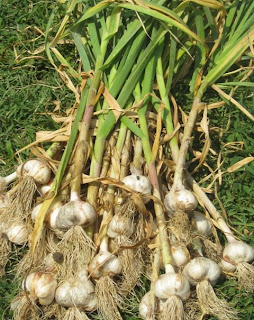 Originally we had planned on planting hardneck garlic, which produces delicious scapes or flower stalks, but our favorite seed source--Southern Exposure Seed Exchange--ran out. 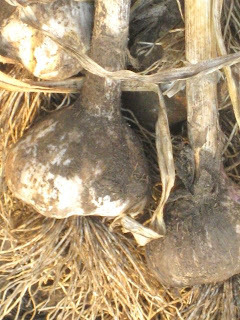 Garlic will last months if it is dried and "cured" in a dark and relatively cool place. The curing process typically means hanging the garlic so that each head has good air circulation around it. Some authorities recommend leaving the dirt on during the cure, then brushing it and any loose skin away. However, all of our produce has to come into the house. We don't have a good work area other than the kitchen--not yet, anyway. So I clean the garlic before curing it. 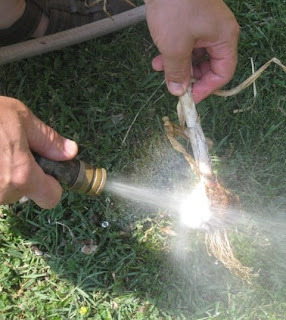 A thin jet of water from the garden hose quickly washes away the dirt and removes a layer of skin, revealing the pearly white heads underneath. All this garlic should keep us for a long time. It may even be time to start looking for some good garlic recipes. An acquaintance, Susan Belsinger, wrote an entire book about garlic, "The Garlic Book: A Garland of Simple, Savory, Robust Recipes." Do you know it? Our friends Emma, Lucy and Asher came over for lunch yesterday. Since kids are always looking for something fun to do, we took them into the garden to see if there was anything ready to harvest. They pulled some radishes. Then we wandered over to the potato bed. Was there anything happening under the surface we should know about? 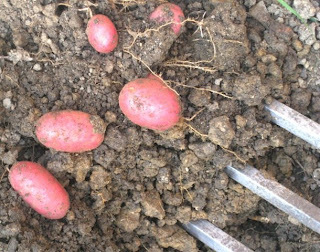 A turn of the forked spade revealed the bottom of one potato plant covered with spuds. What a great surprise! 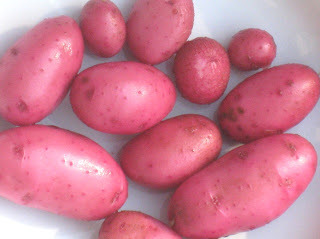 These are what you would call new potatoes. We planted them March 18. In a little more than three months they are just big enough to eat. The largest still fit easily in the palm of my hand. They cleaned up very nicely, our first potatoes. They have an especially vibrant flavor, coming right out of the ground. But the real satisfaction is knowing we could harvest them in our own kitchen garden in the District of Columbia, about a mile from the White House. We boiled them, then tossed them in butter. They made a delicious lunch. The cucumbers are starting to take flight. Time to get them growing vertically. Two varieties were planted in a long line with patty pan squash at the far end. Growing them up a trellis is the only way to manage them. Our trellis is constructed of 1 1/2-inch PVC pipe cut to fit. The pipe and various fittings--elbows, T's--are all available at the local hardware store. You could probably do the same thing much more organically strapping together lengths of thick bamboo. The poles are supported with lengths of metal electric conduit pounded into the ground. The PVC simply slides over the conduit. To hold the structure in place, clothesline anchors both ends. The one weak point was the joint holding the horizontal pieces together in the middle. I resisted cementing this joint together but found that a strong wind was just as likely to buckle the whole trellis in the middle. Now this very long piece just barely stores in the garage over the winter. 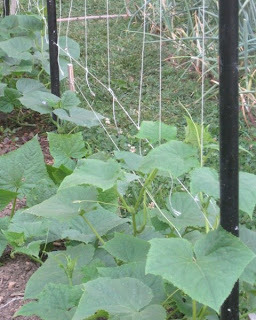 The rest of the trellis disassembles easily and can be bundled together when the season is over. 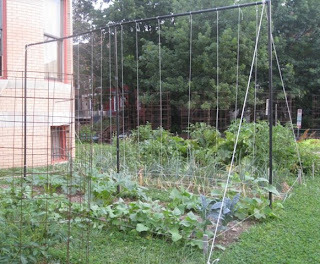 One length of twine is strung horizontally a few inches above the ground between the legs of the trellis. 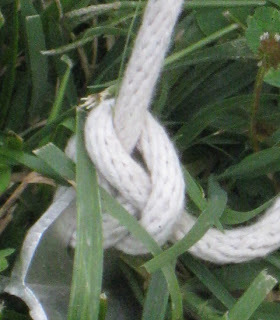 It only takes a few minutes to attach vertical strings corresponding to each plant. 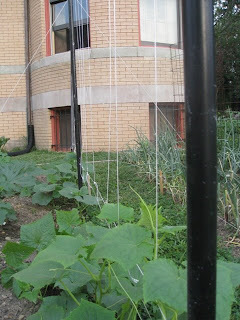 The cucumbers happily attach themselves to the strings. Plan on spending a few minutes each morning giving the plants a little push in the right direction. Eventually this will become a wall of green--and lots of cucumbers for the pickle jar. Painted black, the trellis is barely visible in the garden. To make sure it doesn't topple over (not a pretty sight), the ends are anchored firmly to the ground with tent stakes. Sour cherry cobbler with farm-fresh half-and-half. 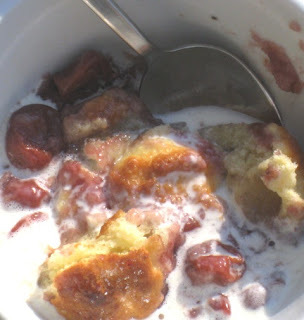 Here's a real treat first thing in the morning: fininding sour cherry cobbler left over from Sunday's dinner. Quick! Get me a bowl! I heated the cobbler in the microwave, then doused it with some of the sweet half-and-half we get delivered from South Mountain Creamery. There are endless possibilities for mixing and matching ingredients with whole grains to create dynamite salads and pilafs. Barley is often overlooked and that's a shame. It's full of nutrition and has the most agreeable chewy texture that I love to bite into. As if that weren't enough of a recommendation, it is ridiculously inexpensive purchased in the bulk section. Our local Whole Foods now carries two types of barley in bulk. One is the traditional pearled barley that you see here. The second is called "hulled" barley, which actually is more of a whole grain than the pearled variety. "Hulled" barley, with a longer, narrower shape, has just the outermost and toughest hull removed. The bran, full of fiber and vitamins, is left intact. Pearled barley, by contrast, is processed to remove all of the hull and the bran, leaving it with that bright, pearly white finish. "Hulled" barley takes a bit longer to cook and has a chewier texture. Since I already had some pearled barley in the pantry, that's what I chose to use for this dish. 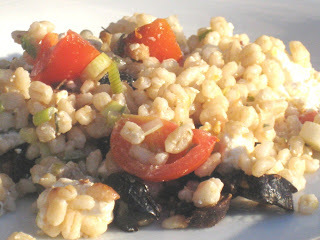 To make the salad, I cooked 3/4-cup dried barley in 1 1/2 cups lightly salted water until tender. I spread the cooked barley on a baking sheet to cool. Meanwhile, chop one long onion scape from the garden into small pieces and toss it in a mixing bowl with about 1/4 cup marinated black olives, pitted and coarsely chopped, a big handful of cherry tomatoes, cut into quarters, a couple of ounces Feta cheese, crumbled, and a couple teaspoons coarsely chopped marjoram leaves fresh from the garden. Marjoram is a close cousin of oregano but the leaves are smaller and sweeter. It's used quite a bit in making sausages and also in some stews and pasta sauces. I like its pungent, assertive flavor. But if you can't find it, you could easily substitute oregano or even torn basil leaves for a very different twist. To season the salad, I made a quick vinaigrette from 1 teaspoon Dijon mustard, a tablespoon red wine vinegar and a couple tablespoons extra-virgin olive oil. Toss the vinaigrette into the salad and season with coarse salt and freshly ground black pepper. Note: if you don't happen to have onion or garlic scapes growing in your garden, feel free to substitute chopped scallions. It has always struck me that something looked terribly out of whack about the seafood selection at Whole Foods. Why, I wondered, were there so many fish species on display that I knew were listed as "avoid" by the organization I regularly rely on for seafood sustainability information, the Monterey Bay Aquarium's Seafood Watch program? I had always planned to do a little more digging on the subject. But now it turns out I needn't have. Greenpeace has done all the work for me, and my suspicions have been confirmed. No less than 16 of the seafood species that Whole Foods sells appear on the "red list" of seafood that Greenpeace says consumers should avoid as unsustainable. Whole Foods scores only 36.5 out of a possible 100 in a recent survey Greenpeace conducted looking in detail at the seafood sustainability practices of the nation's largest supermarket chains. But by comparison, that wasn't bad at all: Whole Foods was at the top of the list of the 20 supermarket chains Greenpeace examined. Consumers buy more than half their seafood at supermarkets. Nationally, it's a $16 billion industry. But as Greenpeace found, most of the country's grocers are utter failures when it comes to helping to protect the world's oceans and the creatures that live in them. Most have no sustainability policy at all. Some seem downright hostile to the idea of taking any responsibility toward preserving ocean life and habitat. Greenpeace does find some reasons for hope. Chains such as Whole Foods and even retailing giants such as Wal-Mart and Target are making moves toward being more conscientious corporate citizens where the oceans are concerned. Others, such as A&P and Trader Joe's, seem utterly clueless. What's a consumer to do? Mostly I use the Seafood Watch guide to inform my seafood purchases. Personally, I think we would all be better off not buying ocean fish any more until this industry--so much like the wild, wild west in so many of its flagrantly unsustainable ways--gets its act together. We would be better off sticking to sustainably farmed choices such as tilapia, catfish, trout, striped bass, mussels and clams. That's not likely to happen any time soon. In fact, restaurants flagrantly offer overfished species such as red snapper on their menus, while seafood too often carries erroneous labels in the supermarket. A recent Consumer Reports survey, for instance, found that more than half of the salmon fillets its researchers purchased were labeled as "wild caught" when in fact they were farmed salmon. Seafood sustainability is still a morass for consumers. There is no standardization in labeling. There are too many species and too many different issues involved in the catching of seafood for the average person to keep track. But what's worse, the various organizations agitating for seafood sustainability don't agree on the information they give and sometimes are completely at odds. Groups such as Seafood Watch, Blue Ocean Institute, Environmental Defense, Oceans Alive and Greenpeace all need to get together and create a common convention for seafood sustainability that we can all understand. They need to start speaking in unison and in a language consumers can easily comprehend. "Hoki," and "Redfish" don't even appear in the Seafood Watch listings, for instance. According to Greenpeace, pollock--a bedrock species in the Alaskan fisheries and one of the most widely used fish in the prepared foods industry--"has not recovered from overfishing." Seafood Watch, meanwhile, labels pollock a "best choice" because of "a generally healthy and abundant fish population and responsible fishery management." Greenpeace says to avoid sea scallops, especially those from the Mid-Atlantic region. It particularly does not like the dredging method used to harvest scallops--dredging destroys the seafloor habitat. But while acknowledging that dredging causes "significant habitat damage," and advising against Mid-Atlantic scallops, Seafood Watch says scallops caught in the Northeast U.S. and in Canada are a "good alternative." I could go on and on, but I would just confuse you and myself with all the nuances of the sustainable seafood debate. In this area, if you want to be "green," you just have to do your homework and make your own decisions. If you have the time, do take a look at the Greenpeace report (the pdf file may take a minute to upload, and you will need the most current version of your reader). The executive summary doesn't take long to read. You will probably find some arresting information about your favorite supermarket, and the rest of the report is chock full of valuable information. It will be years before some parts of the Midwest recover from record floods and already the damage is pushing up the price of corn and soybeans, deepening the world's food crises. 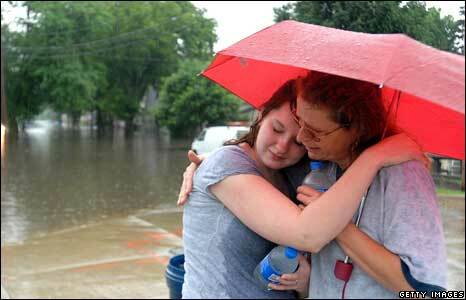 Now comes news that the flooding in significant part can be blamed on man's imprint on the land. Plowing prairies into croplands, diverting streams and waterways, developing wetlands, farming too close to rivers--all this human alteration of the landscape has turned places like Iowa into washboards where heavy rains turn into floods instead of percolating into the soil. With the federal government encouraging farmers to grow even more corn to make ethanol, lands previously reserved for conservation are being plowed under as well. Besides having a huge mess to clean up and tens of thousands of people homeless, Iowans now are worried about what may have gotten into their drinking water. A huge swath of territory from the Dakotas down to Ohio was losing fertilizer applied to the soil at a rate of 4 percent each day. Heavy snowfalls and an early snowmelt also was contributing huge amounts of amonia from the region's giant hog feedlots. Some 70 cities draw their drinking water from the Mississippi River. At the mouth of the river, researchers even before the flooding began were finding nitrate levels spilling into the Gulf of Mexico 37 percent higher than last year--and that was the highest since records began in 1970. Fertilizer runoff creates a "dead zone" in the Gulf of Mexico about the size of New Jersey. This year promises to be bigger than ever. It may be too long ago for most farmers to remember, but growing crops used to be more environmentally friendly. One of the methods farmers used to increase fertility and save the soil was crop rotation. That went out the window with artificial fertilizers and chemical pesticides (and look at the results). Now, with growing demand for organic produce, researchers are taking a second look at natural methods of growing grains, including crop rotation. Tests are underway at the Agricultural Research Center in Beltsville, MD, just a few miles ouside the nation's capital. With concerns about agricultural runoff, the rise in food prices and projections of global food shortages, the work is considered more important than ever. "More and more, people are looking for the best way to grow grain crops organically," said researcher Michel Cavigelli. Cavigelli recently published findings showing the longer the rotational cycle for corn, the more corn produced. Rotating corn, soybeans and wheat over four or more years - and adding hay to the cycle in late summer - increased corn yields by up to 30 percent, compared with a standard two-year cycle, he said. Any chance of this getting back to farmers in Iowa? If it's not corn, it's tomatoes. Federal officials are still trying to figure out where the salmonell-infected tomatoes that have made hundreds of people sick came from. At the center of the search is the hapless federal food safety watchdog, the U.S. Food and Drug Administration. The salmonella outbreak in tomatoes comes just months after the FDA released a "food protection plan" that was, in the words of Health and Human Services Secretary Michael O. Leavitt, "a strategy of prevention, intervention and response to build safety into every step of the food supply chain." "Since FDA’s Food Protection Plan was first released in November 2007, FDA has added few details on the resources and strategies required to implement the plan. FDA plans to spend about $90 million over fiscal years 2008 and 2009 to implement several key actions, such as identifying food vulnerabilities and risk. From the information GAO has obtained on the Food Protection Plan, however, it is unclear what FDA’s overall resource need is for implementing the plan, which could be significant. For example, based on FDA estimates, if FDA were to inspect each of the approximately 65,500 domestic food firms regulated by FDA once, the total cost would be approximately $524 million." There's plenty of blame to go around, however. The Bush administration as well as Congress have long known that the agency responsible for the safety of the nation's food supply is in tatters. One begins to wonder how many poison outbreaks and meat recalls it will take before our federal government will do anything about it. Oh, and the taint of human activity has a mighty long reach. Scientists are now discovering man-made pollutants in deep-sea squid and octopi. In a study to be published in the journal Marine Pollution Bulletin, researchers report finding a variety of chemical contaminants in nine species of cephalopods, a class of organisms that includes octopods, squids, cuttlefishes and nautiluses. "It was surprising to find measurable and sometimes high amounts of toxic pollutants in such a deep and remote environment," said one of the study's authors, Michael Vecchione of the National Oceanic and Atmospheric Admistation's Fisheries' National Systematics Laboratory. Among the chemicals detected were tributyltin (TBT), polychlorinated biphenyls (PCBs), brominated diphenyl ethers (BDEs), and dichlorodiphenyl-trichloroethane (DDT). The really bad news for sea creatures is that these toxins are known as persistent organic pollutants (POPs) because they don't degrade but remain in the environment for a very long time. Cephalopods are important to the diet of cetaceans, a class of marine mammals which includes whales, dolphins and porpoises. Recent studies have reported the accumulation of POPs in the blubber and tissues of whales and other predatory marine mammals as well as in some deep-sea fish. Other investigators had speculated that the pollutants in marine mammals had resulted from feeding on contaminated squids. Meanwhile, more and more of Alaska's prized chinook salmon--aka King salmon--are being infected with something commonly called "Ich" that turns the fish mealy and stinky and is being attributed to global warming. As much as 30 percent of the salmon catch is being tossed aside as inedible because of the infection. "Ich" stands for a microscopic parasite called Ichthyophonus hoferi. Ich (pronounced "ick") is a well-known disease, harmless to humans, that was blamed for devastating losses in the herring fishery in Scandinavia. A similar parasite can infect aquarium fish. The emergence of disease in Alaska's most prized salmon has come as a shock to fishermen and fisheries managers. Alaskan wild salmon has been an uncommon success story among over-exploited fisheries, with healthy runs and robust catches that fetch ever higher prices at fish markets and high-end restaurants in Los Angeles, New York, Tokyo and London. But then infected salmon started showing up in the state's spawning grounds, their flesh and organs mottled with telltale spots. The disease is being linked to rising temperatures in the spawning waters, such as the Yukon River. As temperatures rise, "Ich" moves in. It's the kind of redistribution of disease that can be expected with climate change, said Richard M. Kocan, a fish disease expert at the University of Washington. "Everything is getting warmer, and that's how climate change is going to redistribute all kinds of disease," Kocan said. "Parasites have their optimum conditions -- upper and lower limits. We'll notice where they show up but not necessarily where they disappear." Some experts fear that salmon in the Pacific Northwest will go extinct unless something is done to cool the warming spawning waters. And that brings us to jellyfish. If you're a swimmer, you want to avoid these transluscent blobs because of their stinging tentacles. Here around the Chesapeake Bay, certain seasons seem to bring hordes of the slimy creatures, making swimming impossible. Now scientists see a dramatic proliferation of jellyfish in oceans around the world as being driven by overfishing and climate change, a sure sign of ecosystems out of whack. In the Mediterranean, exploding numbers or jellyfish have devastated native marine species and threaten seaside tourism. Two centuries worth of data shows that jellyfish populations naturally swell every 12 years, remain stable four or six years, and then subside. This year, however, will be the eighth consecutive year that medusae, as they are also known, will be present in massive numbers. Overfishing of other species creates room for jellyfish to prosper. Scientists were not surprised to find a huge surge in the number of jellyfish off the coast of Namibia in the Atlantic, one of the most intensely fished oceans in the world. Warmer ocean temperatures prolong reproduction cycles. Put it all together and you get oceans full of jellyfish. It would be unfair to ask me for my favorite cooking method because I would answer without a moment's hesitation: spit-roasting. Nothing develops flavor quite like a well-chosen piece of meat turning slowly over (or in front of) a low fire. I wish I could say my method involved something as romantic as a stone fireplace and an old clockwork turning mechanism. No, I'm of the modern age. I simply purchased the appropriate parts and electric motor for my Weber charcoal grill. All that involves, really, is a metal collar that fits over the top of the grill with a place for the motor and the long spit. I've roasted all kinds of things on this setup--chicken, leg of lamb, lamb shoulder, beef roast. My favorite is a rack of pork. A rack of pork is simply the porcine equivalent of a standing rib roast. But try telling that over the phone to a clerk in the meat department at Whole Foods. This turned into a long and tortuous conversation. What you want to ask for is a pork loin center rib roast. Picture pork chops before they are cut into individual chops. This particular roast, taken from the center of the loin or even closer to the front of the pig, will yield some very thick chops when the meat is finally cooked and you carve it into pieces. 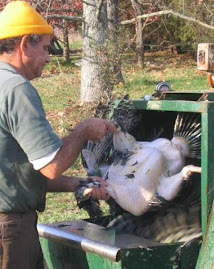 Just be sure to tell your local meat clerk (if you have an actual butcher, so much the better) that you want the chine removed from the roast to make for easy carving. When the time comes you simply slice through the roast along the ribs to make chops such as the one pictured above. A juicier, more flavorful piece of pork is seldom found, especially if the pig has been raised outdoors and allowed to root around, not one of those pale industrial pigs brought up in a confinement lot. The occasion for this roast was the in-laws coming to dinner along with friend Michael from California. We wanted to show off the produce from our kitchen garden so we opened a bottle of Prosecco to serve with bruschetta slathered with our own fava beans and Pecorino cheese. We put out a bowl of our pickled green tomatoes as well as a selection of freshly pulled radishes. The lettuces are wanting to bolt. Still, we were able to assemble a large salad with pickled beets, goat cheese and a vinaigrette with shallots. 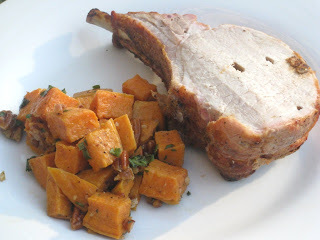 With the pork roast we served our favorite sweet potato salad with toasted pecans, fresh onion scapes and an orange-maple dressing. Dessert was a monumental sour cherry cobbler using cherries we picked last season, pitted and froze. Oh, it was a lovely meal. And I was feeling especially smug, because I had gotten the timing of the pork roast just about perfect. Season the meat liberally with salt and pepper. I light the coals in a charcoal chimney, then spread them around an aluminum pan I keep at the bottom of the grill to catch the drippings. Toss some rosemary sprigs on the coals for flavor. Count on about an hour to cook, but don't be afraid to take its temperature often as it finishes, using an instant-read thermometer inserted horizontally into the middle of the roast. If you haven't had too many cocktails, you'll remember to take the roast off the fire when the internal temperature reads just shy of 130 degrees. Let it rest on a cutting board for 15 minutes. While it is resting, the temperature will climb another 10 degrees, resulting in meat with just a faint blush of pink. Your guests will think you are a genius. Fried eggs with last night's liver and onion scapes. Our onions lately have been sending up flower stalks, or scapes. You might read more about garlic scapes. But onion scapes are equally delicious, chopped fine as a garnish or as an ingredient. Pesto from scapes seems to be all the rage these days. We are happy to cut them off the onion plant and eat them, which forces the onion to focus more on what it does best--making onions. In the winter we get eggs in our CSA box from our farmer friend Brett. Brett's chickens roam around a movable enclosure, pecking at weeds and bugs. In the warmer season we sometimes visit Brett's stand at a Saturday farmer's market a couple of miles away, specifically for the eggs. You can identify eggs from free-roaming chickens immediately by the deep orange color of the yolk. That's the beta carotene from eating all those weeds. Industrial eggs come from chickens that are crammed together indoors. They feed on corn and soy. Instead of protein from bugs, they get theirs in a feed mix from all kinds of industrial sources: feathers and other chicken parts, beef fat, bone meal. Their yolks are pale yellow, absent the beta carotene. Needless to say, eggs from pasture-raised hens are more nutritious. They have more in vitamins A and E, more folic acid, lutein and beta carotene. They are also dramatically richer in omega-3 fats. Freshness and better nutrition are among the reasons we will sometimes make a special trip--and pay more--to get our eggs from a local farm. We also like the idea of supporting a local farmer. Liver and egg yolks have the highest concentration of biotin--a B vitamin--of any foods. Biotin is vital for the digestion of fat and protein and also promotes healthy hair, skin and nerves. 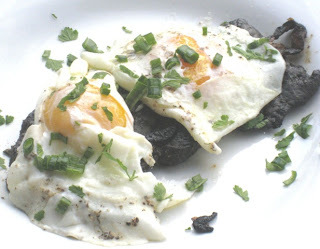 So next time you're thinking about liver, include an egg. Or, make chopped liver the old fashioned way--with chopped eggs. Sometimes weeding the vegetable garden can be like pulling teeth--literally. Weeds are a fact of life for the organic gardener. No one's found a way yet to get rid of them entirely. Sometimes we are a bit careless in the way we make our compost and end up spreading grass seeds around the garden beds. This poses a special problem if, like me, you plant most of your vegetables directly into the ground, rather than starting them in flats elsewhere and transplanting them. Sometimes the weeds appear in a riot of growth before the vegetables even get a chance to germinate. Or so it seems. In this case, I had planted eggplant seeds in an area that was very quickly taken over by crabgrass. Rather than pull out everything willy-nilly, I got my needlenose pliers to perform some close-in, surgical work. 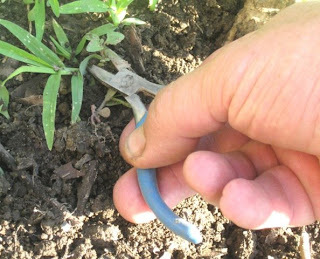 With the pliers, I can get under the soil surface and take a good grip on the grass stem just above the roots. After a soaking rain, the weeds come out easily. Using the pliers is slow, but that forces me to look closely at everything I am pulling out of the ground. This is much more precise than anything my stubby fingers can do. I'm less likely to destroy my eggplant seedlings. Yes, this kind of weeding takes patience. But after an hour's work, the entire bed is weed-free. Hopefully, I won't have to do this again any time soon. 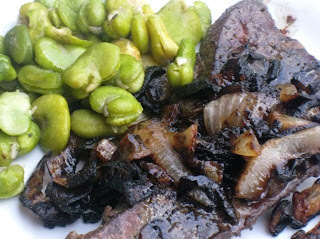 The fava bean is the original Old Wold bean. Other beans originated in the Americas. Picked when the pods are green and plump, the barely mature beans are sweat and tender, tasting like fresh peas. But getting them from the garden to the dinner plate takes a bit of work. 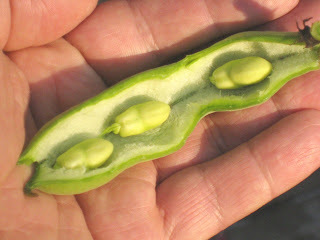 The fava bean is doubly protected--first in a very large pod with a pillowy lining, then inside a fairly tough casing. To extract the bean from the casing, blanch the beans in a large pot of boiling water for 30 seconds. 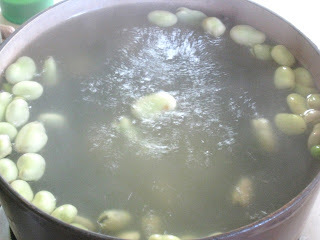 Transfer the beans to a bowl of cold water to arrest the cooking process. This can be done in batches. Allow the water to come back to a boil before proceeding with the next batch. On one end of the casing you'll notice a very dark indent. 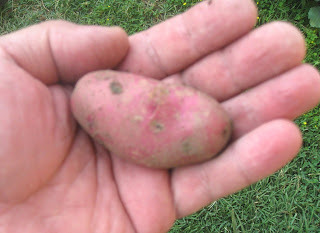 This represents the fava's belly button. The other end is smooth, with an airfoil shape. To open the casing, use the tip of a paring knife to make a crescent-shaped incision along the smooth end. Gently squeeze between thumb and forefinger at the opposite end. The bean should slide out. Older beans are more difficult to remove--another reason to pick the favas at their peak, when the pods are plump and bright green. 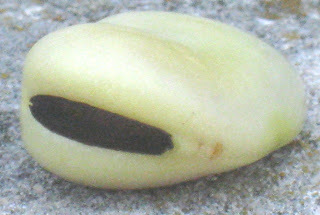 A dull or browning pod indicates advanced age. Free of its casing, the fava is ready to finish cooking any way you'd like. 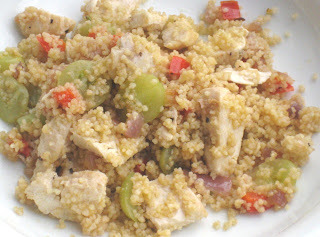 Whole wheat couscous with grilled chicken and green grapes, left over from making client meals. There are more traditional and elaborate ways of making couscous but we just let it make itself. Pour boiling water to cover the couscous in a mixing bowl, then cover with a tight-fitting lid. Wait till the couscous absorbs all the water. This dish would be a perfect way to use leftovers from a roasted chicken. Just tear up the meat and stir it into the couscous. Add halved green grapes and just about anything else you like. Here you see sauteed red bell pepper and red onions. I could easily see chopped parsley or mint in this dish. You could also add nuts: almonds, walnuts, etc. Season with extra-virgin olive oil, red wine vinegar or lemon juice, salt to taste. Our local health food store sells whole wheat couscous (Whole Foods used to as well, until they got more corporate). But if you can't find whole wheat, conventional couscous, quinoa or millet would work just as easily. We love our whole grains. The world's food system is taking on a surreal quality as the hinges fall off. On the one hand, hedge funds and investor syndicates eager to turn hunger into gold are buying up everything from fertilizer factories to farmland in Africa. Then, just as the experts warn that the fragile supply-and-demand equation will not survive any untoward weather events, torrential rains and flooding threatens to wipe out the Midwestern corn and soybean crops. The world's nations convened a food summit in Rome to address runaway food prices. It went nowhere. While a billion people face starvation, no one wants to be the first to sacrifice his country's crop subsidies, and the U.S. refuses to acknowledge that turning corn into fuel for automobiles is a dumb idea. A bleak tableau started to look like a Mel Brooks farce as the head of the U.S. Food and Drug Administration sat before Congress and refused to say what it might take to devise a system that could put disease-free tomatoes on America's dinner tables. Tomatoes tainted with salmonella forced groceries and restaurants everywhere to pull them from the food chain, but the federal government it turns out has no way to trace where they came from. Lawmakers simply cannot wrap their heads around the idea that the industrial food system they've been promoting lo these many years has run off the rails. You may be asking, Are there any rays of sunshine in this gloomy picture? Well, subsistence farmers in some countries are beginning to get the idea that there may be some opportunities to be had in the worsening food crisis. You remember them. These are the farmers who've been pushed to the brink by international monetary policies that favor big farms that use chemical fertilizers and pesticides to grow commodity crops. Farming to feed yourself has been a losing proposition. In Rwanda, for instance, some entrepreneurs are heading back to the land to take advantage of spiking corn prices. Rising prices mean farmers have incentives to plant more after decades of productivity declining under the weight of poverty, foreign competition and a marketplace flooded with subsidized food. "This might be one of the best opportunities that poor subsistence-level farmers will ever have to claw their way out of poverty," said Josh Ruxin, founder of Access Project Rwanda, an anti-poverty advocacy group. "For the first time in years, they might be able to make some money." Helping small farmers is a bargain. Just $70 worth of basic assistance, such as better seeds and fertilizer, would enable the average African farmer to grow an additional ton of corn. Delivering the same amount of corn as emergency aid would cost $700. Still, international donors, the World Bank and most African governments for decades have largely ignored the needs of farmers, despite the fact that agriculture is the continent's largest economic sector and biggest employer. In the U.S., spiking food prices and $4-a-gallon gas may have a silver lining as well: more gardens. Seed companies report sales spiking as much as 40 percent as some Americans discover the joys of growing their own food. “One organic cucumber is $3 and I can produce it for pennies,” said a woman living on the Army base at Fort Campbell, Kentucky. She's dug up her back yard and installed 15 tomato plants, five rows of corn, potatoes, cucumbers, squash, okra, peas, watermelon, green beans. An old barn on the property has been converted to a chicken coop, its residents arriving next month; the goats will be arriving next year. “I spent $100 on it and I know I will save at least $75 a month on food,” she said. A primary reason for soaring food prices world-wide is the increasing taste for meat in prospering India and China. It takes a lot of grain to feed all that livestock. And the United Nations reminds us that there are other costs as well. Farm animals are responsible for an estimated 18 percent of the world's greenhouse emissions, more than all of the cars and trucks on the planet. It can be pretty stinky, too. In one town in Minnesota, residents have been driven out of their homes by the stench emanating from a local dairy's manure pond. Some residents were considering a class action law suit against the dairy, while local officials were planning to file a nuisance charge. Meanwhile, the U.S. Environmental Protection Agency is considering a regulation change that would exempt factory farms from reporting toxic air pollution from animal waste. While industrial fishing fleets drive the bluefin tuna to extinction, European officials thought it might be a good idea to close this year's fishing season early. European governments have largely looked the other way while profiteers ransack the bluefin population. Last year, European fleets exceeded the stated quota by 25 percent. This year's early closure does little to stanch the concerns of environmental groups. "Overfishing and massive illegal catches threaten the survival of bluefin tuna. Fishing should be banned indefinitely at least during June, the key spawning month for Mediterranean bluefin tuna," Aaron McLoughlin, head of WWF's European Marine Program, said in a statement. While the bluefin are getting a bit of a reprieve, some shark populations in the Mediterranean have completely collapsed. According to a new study, the numbers of five different shark species have declining by more than 96 percent over the past two centuries. "This loss of top predators could hold serious implications for the entire marine ecosystem, greatly affecting food webs throughout this region,” said the lead author of the study, Francesco Ferretti, a doctoral student in marine biology at Dalhousie University in Nova Scotia. In November, the International Union for Conservation of Nature warned that more than 40 percent of shark and ray species in the Mediterranean were threatened with extinction because of intense fishing pressure. There's plenty of other news from the food world to jangle your nerves. But if you're still having trouble getting a buzz on, try Engobi. Engobi is some kind of grain-based snack chip that's been infused with 70 percent more caffeine than Red Bull. Apparently, just eating junk isn't enough. It also has to make you want to climb the walls. We're not about to actually consume Engobi. But clicking through its website entertained us for about 30 seconds. Be sure to wander over to "What's Inside Engobi" and click on the various little piles of ingredients. This is what passes as nutritional information for the wired generation. 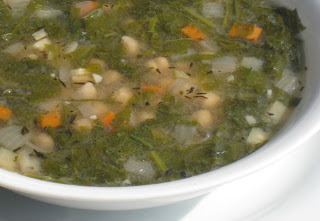 Mongrel soup with chickpeas and greens. As often happens, this soup started with a handful of greens from the garden that had been blanched and tossed in the refrigerator. Add a trip to the freezer, where, in the process of a quick clean-out, I discovered a four-cup container of turkey stock and a four-cup container of duck broth. Once upon a time I had visions of this duck broth as the basis of some grand dining experience. Now it was merely filler for the soup pot. I wanted to make this a bean soup, but the best I could find were some old chickpeas that had been kicking around the pantry. Sweat an onion and a couple of carrots, diced small, along with some parsnip that had been sitting in the crisper drawer too long. Season with thyme. I made the soup a couple of weeks ago. It gets better with age. Now it's just a matter of re-heating. This is one of those soups that can only be considered my personal food. No one else in the family will touch it. "It looks like dishwater," says the wife. My wife hates to see men with their shirts off. "Who wants to look at your big, fat, hairy belly?" she grouses. But when it gets hot, men think nothing of stripping down to their shorts. And not just gardeners. On the running trails all over town, men are huffing and puffing and sweating bare-chested for God and everybody to see. You never hear a peep about it. Some people eschew gardening altogether because they can't stand the heat. Me, I do most of my summertime gardening very early in the morning. But sometimes you just can't help working outdoors in full sun. Out of deference to my wife, what I do is change shirts frequently. On sunny days, when I'm working up a sweat, it's not unusual to see a long line of my shirts hanging out to dry. That's okay for guys, it seems. But I've always been curious: what does the female species do to cope with the heat? You rarely see women tearing their tops off to get cool. It hardly seems fare. I hate to think what it must be like under all that clothing. Is this where gardening separates the boys from the girls? 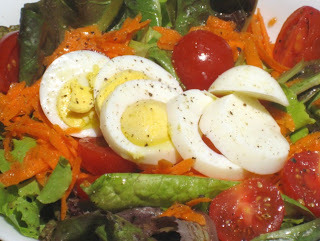 Salad greens from the garden with grated carrot, cherry tomatoes and leftover hard-boiled egg. Season with extra-virgin olive oil, white wine vinegar, a little salt, freshly ground black pepper. Here's a question: Why are brown eggs more expensive in the grocery store than plain white eggs? The only difference between brown eggs and white eggs is that brown eggs are laid by brown chickens. My wife thinks this is simply a marketing scam perpetrated by the egg industry. Usually, we buy our eggs from a local farmer. Paul Roberts, author of the latest book to be titled "The End of Food," was at the Washington Ethical Society for an interview last night. I was not. Twice I ventured into rush-hour traffic for a trip that might take 15 minutes at any other time of day and twice I turned around and went home, stymied by roads clogged with vehicles headed in the same direction. Finally I gave up: It seemed preposterous that I should be spewing carbon to hear a talk about how our industrial food system is foundering over the high price of oil. Fortunately, Roberts also appeared on the local public radio station earlier in the afternoon. Author of a previous book titled "The End of Oil," his riff on food could not have been better timed, as an entire nation agonizes over the loss of its tomatoes because of a salmonella bug that proves impossible to trace. Deadly tomatoes and spinach, millions of pounds of tainted beef recalled, mad cow disease--such is the price of a food system that has lost all sense of human scale and accountability. And as we wave goodbye to cheap oil, food prices spiral out of control, threatening the lives of a billion people or more. The so-called "Green Revolution"--based on artificial fertilizers and diesel powered machines--was supposed to feed the world. It brought us an abundance of cheap food but now, barely two generations later, we are tallying the costs: soil destroyed, air and water fouled, family farms decimated, rural communities obliterated, Third World farmers facing starvation. The food itself, we learn, is not good for us. It's making us fat and unhealthy. In some cases it is lethal. Corporations have made out like bandits feeding us transfats, bovine growth hormones and high fructose corn syrup. As recently as a year ago you could have bought stock in Monsanto and doubled your money. But for the average eater, cheap food has come with a terrible price. And in the end, the world still does not have enough. This does seem to be the ultimate paradox: As a society, we have forgotten how to feed ourselves without destroying the planet. In a competition for people's bellies, the profit motive rules over the collective good. Ten thousand years of learning agriculture have left us not much wiser, staring over the edge of a precipice. For a longer take on Robert's book, I suggest a recent New Yorker essay. The issues are so big, they've left a pall of silence over the political landscape. Our "leaders" seem helpless and without a clue. The public, meanwhile, is sleep-walking into dark and dangerous territory, while the popular media are just now coming to grips with issues that were foretold decades ago. They scramble to write stories about people like us, people turning their yards into vegetable gardens. There's never been a better time to park your car in the garage and putter with your tomatoes. Here's a great leisure activity. Don't we all yearn for a lazy afternoon with nothing more important to do than shell peas? Even daughter got into the act, learning how to use the point of a paring knife to neatly split the pod in two. You can do the same thing with your fingernails--if you have long fingernails. I prefer the knife. 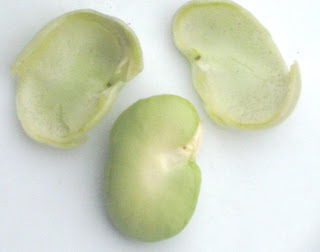 The best peas are still sweet, meaning before the pod begins to turn from deep green to a dirty yellow. 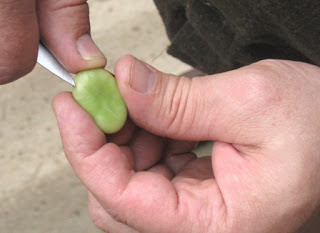 As the pod changes color, it becomes papery and more easily opened to reveal the peas. 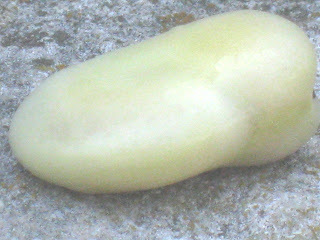 But by that time the peas have begun to toughen and turn their sugar into starch, preparing to become next season's seeds. 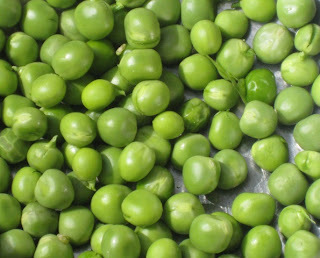 This is an English variety of shelling pea--Wando. The pods are inedible. Pick them when they're plump and green. 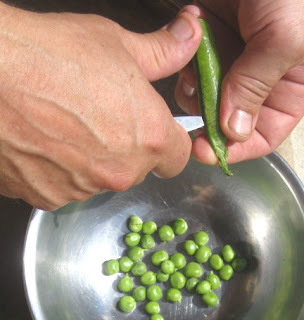 At this point the peas are plump and flavorful, practically bursting from their pods. 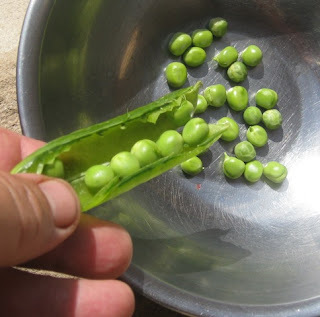 It's a gratifying feeling, opening pods of peas like this knowing they were grown right in front of our house in the District of Columbia, about a mile from the White House. Ours is not a perfect climate for English peas. Spring gets hot and humid early around here, and that's when fungi start attacking the pea plants. Last night we had our peas again with pasta and cream sauce. That's the last of that, says the wife. Too much fat in the cream to eat on a regular basis. Our only disappointment is that we don't have more peas. I could easily live with a garden full of peas. We could pick them all day and freeze them for later. We'll just have to plant a bigger crop in the fall. I suppose that for all the bad things I have done there is a special place in hell reserved for me where I will spend the rest of eternity weeding parsnips. I knew this day was coming. 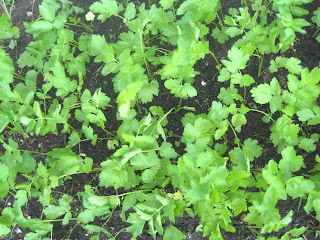 I planted the parsnips from seed March 7 directly in the soil in a section of a very rich bed about six feet long and four feet wide. Parsnips, like their cousin the carrots, take their sweet time germinating. 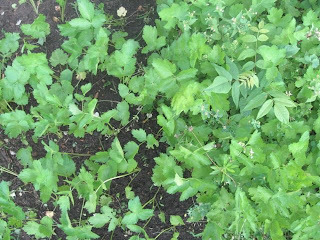 As I suspected, weed seeds quickly sprouted and surrounded the parsnips. I waited until the parsnips were big enough to be easily identified before attacking the weeds. By that time the weeds were thick and tall and wanting to go to seed. I gave the garden a good soaking yesterday and today I was up at 6 am to face the weeds in my parsnip patch. There's no other way to do it except dig in with your fingers, moving slowly, being ever so careful not to pull up a baby parsnip. Inevitably you will grab one by mistake and the best you can do is dig a new hole for the long taproot and hope it survives. In the picture above, you can see clearly the area on the left that was weeded, and the area on the right that is yet untouched. 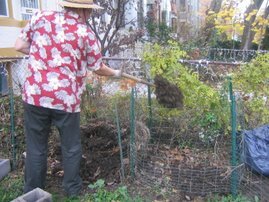 I work slowly around each plant, sometimes using a dinner fork to get into tight areas where small weeds maintain a tenacious grip on the soil. When the weeds are finally gone, as seen in this photo, the parsnips stand tall and lanky. With no weeds to lean on, they want to flop over. But they are still young. They will grow much larger and eventually create such a thick canopy over the soil they will provide their own mulch, holding moisture in the soil and preventing weeds from taking hold. Or such is the hope. 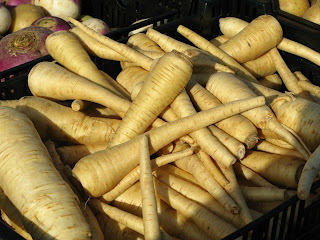 We love parsnips for their musky flavor and as a source of good nutrition. Seen here in a farmers market display back in January, parsnips are rich in potassium. A cup of sliced parsnips contains around 100 calories. They tend to overpower stocks and vegetable soups, but they are delicious roasted with other root vegetables or all on their own. Try adding roasted parsnips to a fall salad. Do you have any great parsnip recipes you'd like to share? 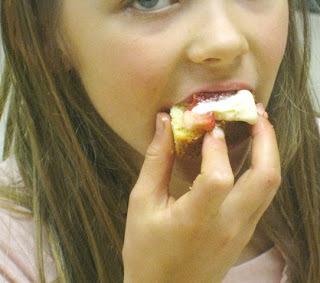 My idea for our final "food appreciation" classes of the year was to treat the kids to angel food cake. But if you read my earlier post, you know how that turned out. I needed a replacement concept, fast. It occurred to me that we'd spent so much time peeling vegetables in recent months that it had become a sort of theme for the semester. Why not a peeling contest? Before it was over, I would purchase 10 pounds of carrots and 15 pounds of potatoes. This is how it works: first, the carrots. Each kid gets a carrot and one chance to peel it while the rest of the class looks on and keeps time. One-one-thousand, two-one-thousand, three-one-thousand. And so forth. We work our way around the table. There are skill as well as safety issues involved. Our first rule, above all else is, Don't get blood in the food! 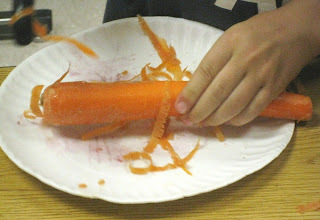 Surprisingly, after four classes completed the carrot peeling, we only had one nick. The kids have learned. Peel one half of the carrot first, peeling away from your fingers. Then turn the carrot and peel the other end in the same direction. I think our fastest time peeling a whole carrot was seven seconds. Peeling potatoes is a different story. Only one contestant out of all four classes was able to peel a potato in less than 20 seconds. Each winner received his own personal peeler. Then we served pound cake from Whole Foods with strawberries and vanilla ice cream. That's one way to end one heck of a year in "food appreciation." 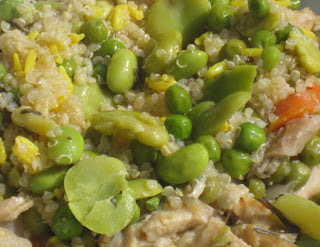 Leftover quinoa pilaf with peas, fava beans and edamame, plus leftover chicken casserole with carrots in peas. Just the thing to heat in the microwave after spending the very early part of the morning harvesting the rest of our peas, removing the pea plants and getting the vegetable bed ready for bush beans and climbing lima beans. It's forecast to be near 100 degrees here in the District of Columbia for the next several days. But with the humidity it will feel like 110. Oh, we are pining for those cool, wet days of April and May. Seems like we have skipped right into August. Stay cool, everyone. Be sure to wear a hat and sunblock if you must be outside. Otherwise, do your gardening at first light, before things heat up. 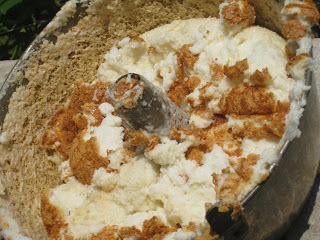 What you see here is an angel food cake that started out with great hopes and expectations and ended in utter disaster. Why, you might ask, is The Slow Cook making angel food cake? Shouldn't he be out tending his garden? The short of it is, we had a freezer full of frozen egg whites from months of recipes calling mostly for egg yolks. The plan was to convert these whites into angel food cakes that I could deliver to the kids in my "food appreciation" classes as an end-of-year treat. The first blunder was dumping a four-cup container of egg whites into the blender bowl. Somehow I had it in my head that this constituted one dozen eggs. In fact, four cups (almost) equates to 24 egg whites--something that was clearly indicated on the label my wife had affixed to the container. I soon realized my error when the eggs white under influence of a rapidly beating blender began overflowing the bowl. After reading the recipe several times and having gotten the procedure more or less fixed in my head, my wife intervened, urging me to measure out the ingredients for both of the two cakes I had in mind, rather than doing them each separately. This is how time is saved in a busy kitchen, she intoned. Not only did I measure out the dry ingredients for two cakes, I mixed them all together. But by some fiendish trick of physics, two cups of double-sifted cake flour mixed with three cups of granulated sugar does not result in five cups of material. Questioning my own sanity at this point, and after a brief huddle with the baking-expert wife, I decided that I must have forgotten two of the three cups of sugar, so I added two more. This is how you end up with a sticky, treacly sweet angel food puddle rather than the light, fluffy angel food cake we had in mind. Make that two cakes down the drain. Kids, I hope you like pound cake from Whole Foods. Rummaging through the freezer the other day, I came across snack bags stuffed with last year's carrots. They'd been cooked, stored and forgotten. I pulled some out to defrost and discovered they make a wonderful meal, simply heated in the microwave. The carrots are still tender and sweet--hard to tell they were harvested 8 months ago. 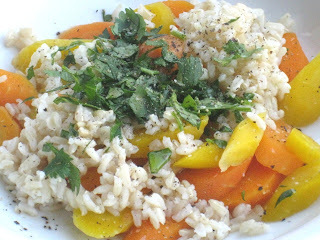 Toss the carrots with some leftover brown Basmati rice and fresh cilantro. Dress with red wine vinegar, extra-virgin olive oil, a little salt, some freshly ground black pepper. Voila: dinner. It seemed that for the longest time we were admiring the flowers on our fava plants. Then one day we looked and where the flowers had been, pods were growing. Now the pods are swelling and seem to be getting longer every day. They are already the size of overstuffed green beans--about five inches long--but they aren't even close to harvesting. No, these pods will get much, much bigger before they are through. 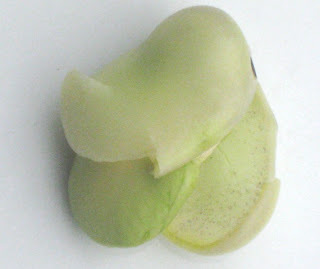 I am totally enamored of our favas. They don't get much of a mention in the vegetable literature, but they are quite a plant. The growth is incredibly vigorous, producing plants upwards of 36 inches tall with a profusion of pointy, grayish-green leaves. The mature plants have a pleasingly complex, architectural quality that makes them a standout in the garden. 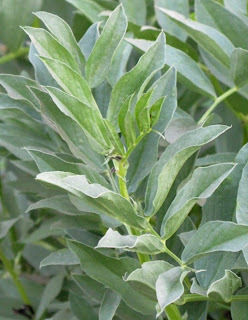 Favas don't like the heat. I planted an entire seed pack--50 seeds--in a small patch on March 4. I suppose I could have planted them earlier. I worry that as temperatures climb into the 80s here in the District of Columbia the plants will poop out on me. But so far they are soldiering on with no sign of stress or disease. And the production of fruit is impressive--there are pods everywhere you look. 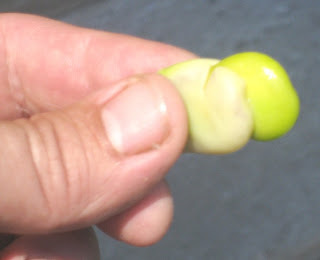 This is what the baby favas look like this morning. They have a pillowy nest inside their pods. As they mature, they will develop a tough casing around the fruit. At this stage, they can be eaten, but I don't recommend it. 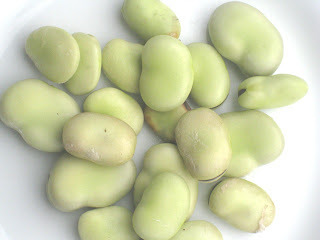 The little ones don't have the sweetness of mature favas and leave and astringent bitterness on the tongue. 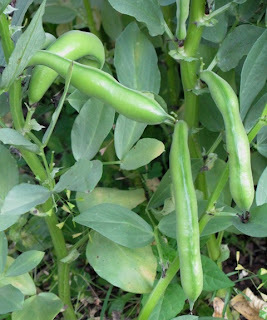 Favas are so easy to grow and so productive. 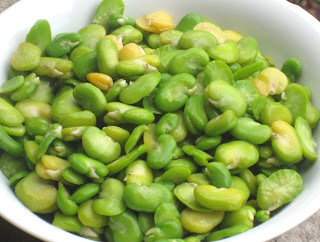 If you have trouble growing peas in our area, try favas.